The Social Science Research Council (SSRC) is proud to announce that Sheila Jasanoff is the recipient of the 2018 Albert O. Hirschman Prize, the Council’s highest honor. The biennial Hirschman Prize is awarded to scholars who have made outstanding contributions to international, interdisciplinary social science research, theory, and public communication. 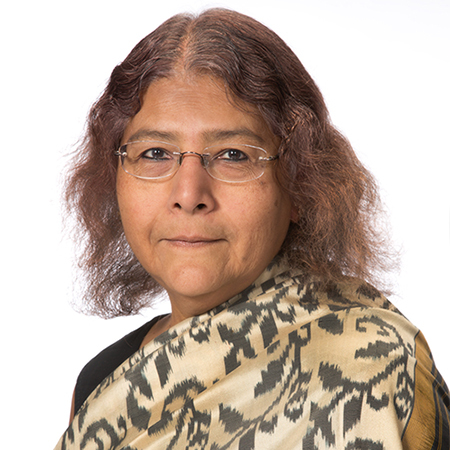 Sheila Jasanoff is Pforzheimer Professor of Science and Technology Studies (STS) at the John F. Kennedy School of Government at Harvard University, where she also holds appointments at Harvard Law School and in the Department of the History of Science. An internationally acclaimed scholar of science and public policy, Jasanoff is a linguist, legal scholar, political theorist, and social analyst. At Harvard, she founded and directs the Program on Science, Technology and Society. Previously, she was the founding chair of the Department of Science and Technology Studies at Cornell University, ushering in a new interdisciplinary field in the US academy. The institutionalization of this field required the development of both groundbreaking research and new institutional settings and curricula. Over the course of her career, Jasanoff has made invaluable contributions to scholarship and intellectual field building, always with an eye to also making a contribution to public discourse and deliberative democracy. Jasanoff is the author or editor of more than 15 books and the author of over 120 academic articles. Her pioneering scholarship has examined how nations, courts of law, legislators, policymakers, and advocates address such issues as climate change, emergent biotechnologies, global innovation, and risk. The reach of Jasanoff’s work extends beyond the academy to national and international science policy organizations and regulatory bodies; she has advised the European Commission, the OECD, the National Science Foundation, and the National Academy of Sciences, among others, on issues of science policy. Jasanoff holds AB, JD, and PhD degrees from Harvard University. She has received many national and international honors for her research, including the University of Ghent Sarton Chair and the Reimar Lüst Award from the Alexander von Humboldt and Fritz Thyssen Foundations. She received a Guggenheim fellowship in 2010. She is an elected foreign member of the Royal Danish Academy of Sciences and Letters, and a Fellow of the American Association for the Advancement of Science (AAAS), where she served on the Board of Directors.